A child care provider is no longer the “babysitter” who cares for children while parents work. Instead a child care provider becomes most children’s first introduction to early education. So what happens to the child whose parents simply cannot afford quality child care? How will these children be exposed to early experiences to enhance their development? The answer lies within the Child Care Subsidy System (otherwise known as the Child Care Funding Assistance Program or CCFAP), whose purpose is to aid parents in meeting the cost of early education for their children. As a Registered Child Care Provider for the past decade, I have had numerous families through my doors, families from all backgrounds and economic circumstances with equally diverse children. “Sammy” came to me almost five years ago as a 7-week-old infant. He was born with Club Foot and underwent multiple castings and surgery. He wore a bar between his “shoes” until the age of three, initially all day, but after a few months just during the night while he slept. Many of his developmental milestones — including crawling, standing, walking — were delayed, in part due to his castings and the bar/shoes he wore. I also began to notice a significant speech delay by age two that his primary pediatrician seemed to believe wasn’t there when the mother asked about it at appointments. “Sammy” lives with his single parent mother and visits on the weekends with his father. Mom works a job with minimal pay and lives in subsidized housing; without the assistance from CCFAP, she never would have been able to enroll her infant with me. Due to my education and constant supervision, I was able to discover the speech delay and with the mother enlisted specialists and therapists when Sammy was two and a half years old to aid in remedying this delay. Sammy is now a four-and-a-half-year-old preschooler, and while he still has a small delay, it is just that . . . small. CCFAP made it possible for her to enroll her child in a quality early education program, and thankfully he didn’t fall through the developmental “cracks” he might have without early intervention. According to Jane Reilly, Addison County Child Care Subsidy Specialist, in Addison County alone there are approximately 340 families utilizing CCFAP for financial assistance to send their children to child care (personal communication, November 5, 2014). This includes families who have applied and been approved for assistance, as well as children in protective services. During the year, Reilly receives on average 20-25 new applications for aid assistance. Of these, approximately 75 – 80% are eligible and are granted a subsidy certificate. Parents receive these certificates that outline how much time they are granted, the amount the State of Vermont will pay for their child to attend care, and how much the parent is required to pay as a “copay.” These guidelines are based on need, income, and family size as outlined on Vermont’s Income Eligibility chart. Unfortunately, many families are disqualified based on various factors; often they are above the income guidelines or they do not have a “service need” (J. Reilly, personal communication, November 5, 2014). These children risk being lost in “the system” when the parents simply cannot afford child care costs. Even with the assistance, it is often not enough to make household ends meet. The Income Eligibility chart shows the guidelines for families to receive child care. After the determination is made, it is still up to the family to pay the difference between what the provider charges and what the state offers. There are many ways to decrease this copay cost, one of which is finding a provider who is STARS accredited. A provider who has worked to achieve standards above those set by regulation guidelines can achieve between one and five stars. Each STAR achieved increases the amount of subsidy assistance the parents may receive. 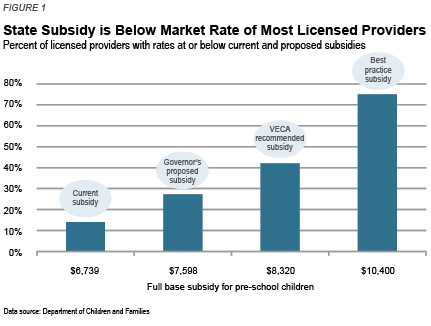 The Child Care Provider Rate Schedule outlines the increase in Subsidy payments for registered and licensed, as well at centers based on the number of STARS the provider holds. (I received my third STAR this fall). This lowers the copay for each family receiving subsidy, while keeping the provider’s income the same. While this works for families in areas where child care options are plenty, those families living in rural areas where child care is scarce often find only one or two providers with openings, and they don’t often get to choose based on criteria like STARS recognition. These families are left either with struggling to make ends meet when enrolling their children in professional care, or with finding family and/or friends to care for their children. While these choices are cost effective, and sometimes the only option for families, it can leave their children without those rich early experiences that enhance development. The problem with CCFAP is two-fold. First, as noted above, Vermont’s base subsidy reimbursement is so low that providers cannot afford to charge families the base rate. Providing child care is a full time job, and child care providers need to make a living. Second, Vermont uses criteria that has not effectively kept up with yearly cost-of-living changes. (Herbst & Tekin, 2010) This makes many families ineligible for assistance, when affording quality child care is not possible. “This limits the availability of quality child care . . . for the lowest-income families, whose children are most at risk of falling behind academically and have been shown to benefit the most from quality child care and early education” (Herbst & Tekin, 2010). Psychologist Erick Erikson (1902 – 1994) described the many stages of development in children. 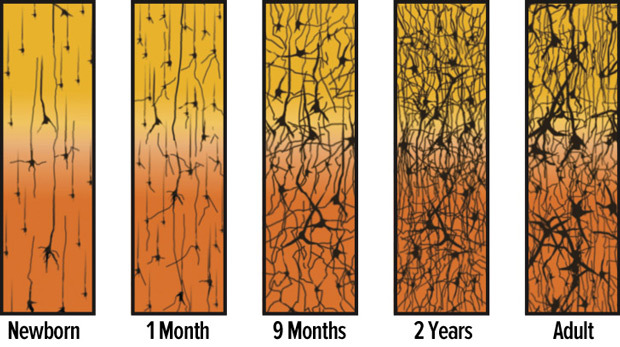 According to Erikson each stage of development plays a critical role in the subsequent stages (Cherry, 2014). Erikson “utilized the knowledge he gained of cultural, environmental, and social influences to further his psychoanalytic theory” (Cherry, 2014). His theories of development demonstrate the need for early experiences and quality early education. In his New York Times obituary in 1994, Erikson was quoted as saying that “in play a child says things without uttering a word. You can also see what’s wrong” (Cherry, 2014). Playing is learning for children, and they need to be given every opportunity to discover their talents, grow, and develop. Many families simply cannot afford to offer their children these early learning opportunities, and even with CCFAP, many of Vermont’s children are missing these early education options. First, child care subsidies encourage maternal employment, which has been shown by previous work to have implications on child well-being. Second, subsidies increase the use of non-parental child care services. Third, subsidies can increase child well-being through increases in parental incomes, which could be spent on goods and services that would enhance the child quality of life.” (Herbst & Tekin, 2010). In Vermont many child care providers have taken steps to do just this by enrolling in STARS and working to increase their STAR level. Unfortunately, as mentioned earlier, some rural areas lack child care options for families in need, including providers with a STARS credential. Every child, regardless of economic/family back ground, deserves quality early education. In order for this to happen, many families must rely on the Child Care Financial Assistance Program to afford quality early education. The U. S. Department of Health and Human Services is working towards increasing the reimbursement amounts for families. They have worked with the Shumlin administration to find a way to make this possible. While both parties agree the system needs an overhaul, including increasing reimbursement rates, neither knows how to yet accomplish this. They don’t agree yet on how much more to spend or where the money should go; into increasing the base subsidy or adjusting the fee scale. Increasing the base subsidy is the only way to improve access to quality child care for all families, especially those at or below 100 percent of poverty—two-thirds of the children in the assistance program. Changing the fee scale could correct a flaw in the system where families with incomes between 100 and 200 percent of poverty—the remaining third of children—find that as their incomes rise they lose more in child-care support than they gain in pay” (Herbst & Tekin, 2010). Fuller, Kagan, Caspary, and Gauthier (Winter-Spring 2002) nailed it on the head when writing that “to achieve welfare reform’s ultimate goal of breaking the cycle of intergenerational poverty and dependence on governmental benefits, welfare-to-work programs should promote learning and development among children in welfare and working-poor families by increasing access to high-quality child care in low-income neighborhoods.” It appears that there is hope in the near future that these changes will come to pass. Then the children who most need access to quality early education, those from low income families who often fall behind their peers, will gain access to the programs they will benefit most from. Every child deserves an equal opportunity for the best education possible, and this begins before “formal education” in the school system. It begins at infancy and continues throughout the preschool years before they even enter traditional schooling. I am hopeful that children throughout Vermont will receive the best start in their early years to enhance their learning and development. I am also optimistic that Vermont’s CCFAP will be able to increase subsidies for families in need in the near future to aid the families who need providers the most. Janette Dumont is a native Vermonter, born and raised on the property in Ferrisburgh where she now raises her own family. Married to the love of her life, she has a nearly 10-year-old daughter and a 16-year-old step son. Janette began college in 1996 and decided after many years to complete her degree in Early Education from CCV. In June 2015 she’ll walk the aisle and graduate with honors. She has owned and operated a registered home child care for a decade. Passionate about her family and her child care, Janette is living her life aiding families in raising their children. She currently is a Three STAR provider and, upon receiving her AA in Early Education, will be a Northern Lights Ladder III provider. Janette always aims to provide the best early education to the children she cares for. Receiving her AA from CCV this June is just a stepping stone on the career path for her, and the future possibilities are endless. Outside of her profession and family, Janette is a lover of nearly all animals. What began 10 years ago as a single kitty, has become three cats, a dog, a rabbit, a hamster, and a 36-gallon fish tank for raising guppies for friends and others. You will often find more 4-legged creatures habituating her master bed than people. This entry was tagged Addison County, CCFAP, Child Care Funding Assistance Program, Child Care Subsidy System, Erik Erikson, Jane Reilly, licensed child care providers, STARS, Vermont Earned Income Tax Credit. Bookmark the permalink.